Cream Cheese Toffee Dip — a “published” recipe. For my birthday this year, I received a brand new community cookbook from my sister in law. When I opened it up the very first recipe in the book was one I had given her a couple of years ago. An honor to be the first recipe! Never mind that “A is for apple dip” and comes in the alphabet before “B is for Bacon Wrapped Water Chestnuts”! 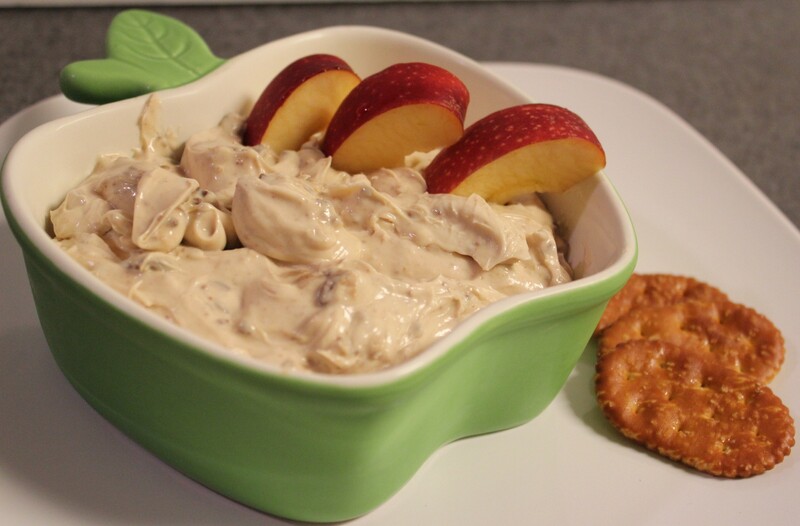 Quick and easy, very simple and totally scrumptious with apples or pretzel crackers. Beat together cream cheese and brown sugar until light and fluffy. The secret is to beat until the volume of the cream cheese is almost doubled. Refrigerate for at least two hours, overnight is even better. Serve with apple slices, pretzels, pretzel crackers or other sturdy dippers. Breakfast to go . . .
Charlene, I love this recipe and will use it for the next football bash. Sounds yummy. I also love the idea of the corn and cooking with the husk on. I’ve done that on the grill, but never in a microwave. Looking forward to more of your recipes! !